(Nanowerk News) Accelerating a free electron with a laser has been a longtime goal of solid-state physicists. David Cline, a distinguished professor in the UCLA Department of Physics and Astronomy, and Xiaoping Ding, an assistant researcher at UCLA, have conducted research at Brookhaven National Laboratory in New York and have established that an electron beam can be accelerated by a laser in free space. This has never been done before at high energies and represents a significant breakthrough, Cline said, adding that it also may have implications for fusion as a new energy source. Each row of two frames represents one snapshot-pair of laser on (on the right side) and laser off (on the left side) with unchanged configuration. One can see a clear increase from these pictures, proof that the laser accelerates the 20 mega electron volts electron beam in vacuum. 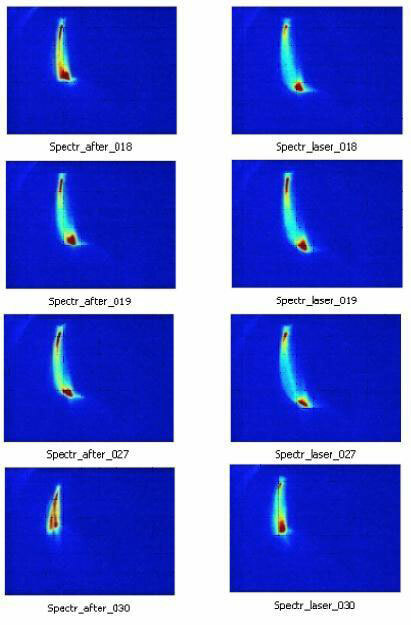 Pictures of the beam momentum spread after the spectrometer taken with the laser off (left column) and the laser on (right column). The length of the beam image reveals the energy spread of the beam. The experiment recorded 30 shots. Twenty shots were high intensity and showed effects of the laser on/laser off difference. Four shot examples are shown here. Pictures are taken from spectrometer on Beam Line #1 at BNL-ATF. In free space, a plane-wave laser is unable to accelerate an electron, according to the Lawson–Woodward theorem, posited in 1979. However, Yu-kun Ho, a professor at China's Fudan University in Shanghai, and his research group have proposed a concept of what physicists refer to as the capture–acceleration scenario to show that an electron can be accelerated by a tightly focused laser in a vacuum. In the capture–acceleration scenario, the diffraction from a tightly focused laser changes not only the intensity distribution of the laser but also its phase distribution, which results in the field phase velocity being lower than the speed of light in a vacuum in some areas. Thus, a channel that overlaps features of both strong longitudinal electric field and low–laser-phase velocity is created, and electrons can receive energy gain from the laser. The acceleration effect increases along with increasing laser intensity, Cline said. This channel for electrons may be useful for other scientific endeavors, such as guiding an electron beam into a specific region of laser fusion applications, he said. A possible application of this discovery is the use of laser plasma fusion to provide a new energy source for the U.S. and other countries. The focus of the laser generates a natural channel that can capture electrons and drive them into a pellet that explodes, by fusion, to produce excess energy, Cline said. With federal funding from the U.S. Department of Energy, a project to carry out a proof-of-principle beam test for the novel vacuum acceleration at Brookhaven National Laboratory's Accelerator Test Facility (BNL-ATF) has been proposed and approved — a collaboration among the UCLA Center for Advanced Accelerators, of which Cline is principal investigator, Ho's group and the Accelerator Test Facility team. BNL-ATF is one of the few facilities that can provide both a high-quality electron beam and a high-intensity laser beam for the beam test, Cline said. Ho's group provides theoretical support. UCLA scientists — Cline, Ding and Lei Shao, a former UCLA physics graduate student of Cline's — are responsible for the whole experiment and the experimental data analysis. Simulation research work and hardware design have been done in accordance with BNL-ATF's experimental conditions. The simulation results predict that vacuum laser acceleration phenomena can be observed with ATF's diagnostic system. Cline, Ding, Ho and their colleagues published two papers last month on this research: "Simulation Prediction and Experiment Setup of Vacuum Laser Acceleration at Brookhaven National Lab-Accelerator Test Facility," in the journal Nuclear Instruments and Methods in Physics Research A, and the discovery paper "First Observation of Acceleration of Electrons by a Laser in a Vacuum," in the Journal of Modern Physics. The major result of the experiment is to show the increase of beam energy caused by the laser, as illustrated in the attached graph of data collected from the spectrometer on beam line No. 1 at BNL-ATF. Each row of two frames represents one snapshot-pair of "laser on" (right side) and "laser off" (left side) with unchanged configuration. One can see a clear increase from these pictures, proof that the laser accelerates the 20 mega-electron-volts electron beam in vacuum. The length of the beam image reveals the energy spread of the beam. The experiment recorded 30 shots. Twenty shots were high-intensity and showed effects of the laser on/laser off difference. Four shot examples are shown in the graph.